“Fall into Fall Quilters Blog Giveaway” – and the winner is ………. Before I announce the winner of the competition I would like to share the story behind the picture. It was a wet, cold night in Paris and Marlene, Jane D and I decided to hit the town. I had been shopping that day and purchased a bra and undies set from Printemps (French version of Target). 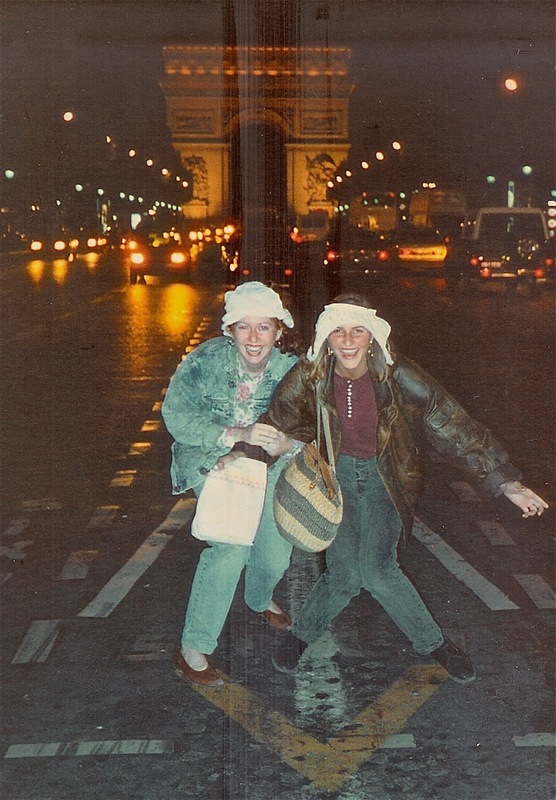 Being young and silly, we decided to get a picture of us in front of the Champs Elysees with underwear on our heads. We waited until the lights turned red and dashed across the pedestrian crossing adorning ourselves with ‘hats’, bending down low so Jane could capture the architecture in the background and then racing across to the either side before we were mowed down by Citroens. This was all achieved in under one minute. This picture has remained one of my all time favourites. Such fond memories of Paris in 1989. A big Thank you to everyone that entered my giveaway. I enjoyed reading through all the comments. The winner of the 2010 ‘Fall into Fall Giveaway’ can be found on the original post. Congrats To the winner. Jane it looks like you are A bit of A larikin meaning you like having fun. I still laugh at this picture you posted, and remember reading the funny captions people wrote!!! hilarious!! good luck and congrats to whomever wins!! Thank you SO MUCH for the lovely prize, Jane! I am still just beaming from winning your contest!!! Totally made my day, thank you so much! Debi Lohr from ‘Quilting with Debi’ – http://www.debiquilts.blogspot.com is running a Fall Giveaway. Click on the scarecrow on my blog to find about about this exciting new giveaway. I will be adding my gift for the competition to my blog, so keep tuned.The competition starts 1st October and the winner will be randomly drawn on 15th October 2010. Hmmmm, the stash queen will be offering something fabriclicious!